In Tanzania, something occurs every month of the year that is one of the greatest spectacles on earth. Many term it as the greatest show on earth. 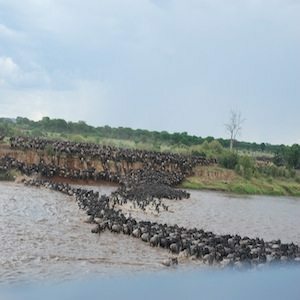 It is the migration of over a million wildebeests and zebra migrating from place to place in search of food and water. Twelve months out of the year, these animals go in search of food (green grass), and water (rain). When it’s dry in a particular location, they move on to another area, when that area dries up they move to another. This is constant, all twelve months of the year, different seasons, between Kenya and Tanzania. 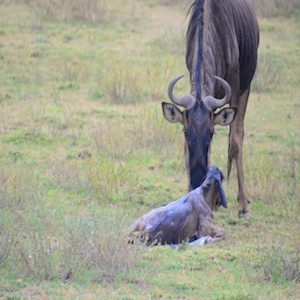 For two to four of these months, generally August through November, depending on the rains, the wildebeest beat a path across the Mara River to head towards Kenya, where the food and water is plentiful. As the weather patterns change, they begin to migrate back to Tanzania, where they work their way around the Serengeti in the next ten months. During the months of late February or early March, it is in the Southern Serengeti where life begins for these wildebeests. All of the babies are dropped usually during this time. This provides more of an opportunity for the babies to survive, when all of them are born during the same time period. Wildebeest calves are the most vulnerable, but within five to seven minutes, these young babies must be up and walking, then running with their mothers. This is the season of calving, this is the season where you will see babies from birth, to days old, to a couple of weeks old. It is a spectacular sight. During April and May the wildebeest are usually found near the Moru Kopjes in the South Central Serengeti, as they begin their journey northward. This takes them through the Western Corridor where they can be found during the months of June and July. This is where many of the calves do not make it, it is their first serious obstacle as the cross the Grumeti River. Nearing August and through November, they are usually found in the northern Serengeti ready to cross the crocodile infested waters of the Mara River. Some may remain in Tanzania and others may cross into Kenya. But no matter how many cross, once they cross this river to get to the green grassland, they also must return over the same crocodile infested waters. From December to March, look for the wildebeests between the Central to the Southern plains of the Serengeti. Then their journey begins anew, each and every year, they relocate in search of food and water.